It's almost 9:00. 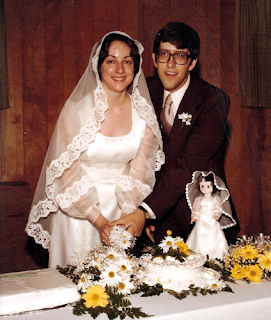 This time thirty-eight years ago, we were on a plane coming into Myrtle Beach for our honeymoon. We had such a short layover in Atlanta that we ran through the airport. Then we left Atlanta late, but the pilot made up the time and we were on time landing in Myrtle Beach. Still, we didn't get to the hotel until after 10. We were so tired! So our first married night, we slept together. Literally. All we did was sleep. And that was a long time ago, when people didn't even sleep - literally - together before marriage. It was good that night, to just sleep with you. It was a wonderful day. We had what was a simple wedding even then, but it was just what we wanted. We were married at 10:30 in the morning, like my parents were. We got to the church early, set up things up for the reception, then got dressed and got married. I'm glad we were married in the days when the reception was punch and cake in the church fellowship hall. People got to move around and talk to each other - you didn't have to spend a whole evening sitting with folks you didn't know. And we got to do the same thing. We got the chance to talk to everybody there. Except that one old lady that nobody ever knew who she was - she didn't stay for the reception. I remember we took the wedding-party photos after the last. The photographer wanted to take them before the reception, but we said no. The wedding party was staying anyway, and there was no point in keeping the guests waiting. So we all trooped back upstairs after the reception and took the photos. Then you and I changed clothes again and helped clean up the church. About twenty of us went out to lunch together. We steered them toward a buffet place and it worked out well. There was your family and mine, and the Shepherds and Dan and Mayre Lou Campbell who had all come up from Atlanta. Then they all took us to the airport and we left for Myrtle Beach. Can you believe that it's been thirty-eight years? I don't even feel thirty-eight years old. And now I'm here and you're there, and my relationship status on Facebook says "widowed." I'm sixty now, something I don't mind but can't seem to get my head around. We look so young in the wedding photos! Now my hair is graying, and yours was white when you died. My skin is starting to show my age, as is my figure. We're not twenty-two anymore, are we? Tonight, that day so long ago seems more real than my present reality. Thank you for all the years and the love and the laughter and the companionship. Thank you for wanting an independent, strong-minded, smart-mouthed woman. Thank you for asking me to marry you. It was a simple moment, but the hinge point of my life. I love you.